Flash Template Editor - Edit and create your own flash templates with ease. - Edit your own stylish flash template with ease! Photo Slideshow Maker provides you with amazing Template Editor in the Premium flash templates. With Template Editor, you can customize premium flash templates and create your own stylish flash template. AnvSoft Flash Template Editor is an easy to use flash template editing program, which enables you to customize every details of flash theme, including background image, photo frame, thumbnail frame, control button, title, description, movie clip and decoration, etc. No matter if you are professional one or with no acknowledge, you can handle the Template Editor easily to build up a self-made flash template. The Flash Template Editor exists in the Professional and Platinum version of Photo Slideshow Maker. Now download Photo Slideshow Maker to experience the Flash Template Editor. Flash Template Edtior provides many customizable items as following for you to create your own stylish Premium flash templates. Background: Dozens of background flash. Photo Area: Photo frames for displaying slideshow. Thumbnail: Thumbnail frames for displaying thumbnail of the photo. Control button: Control button style, controlling the displaying of the slideshow. Title: Style of the title of the premium slideshow. Description: Style of the description for the premium slideshow. Movie Clip: Movie flash clip items for adding to anywhere on the premium slideshow. Decoration: Beautiful decoration overlay the slideshow. 1. Double click the flash items to apply to the customized template, except for Background, which requires only single click. 2. If you want to change or delete a flash item, use your mouse to click on the flash item, then hit the "Remove" button which is above the preview window. It's quite simple for you to customize a self-made flash template using Flash Template Editor. Just as easy as 1-2-3. After choosing photos, go to "Theme > Premium", then click on the Template Editor button, which is under the Premium flash templates area. Then a popup shows, which lets you set the height and width of the customized template. After opening the Flash Template Editor, single or double click on the flash items on the left to apply to your customized flash template. Now you have customized a self-made flash template, click on "Export" button to save it to Photo Slideshow Maker, which can be seen under "Theme > Premium > Custom". And the default path of the customized flash template is C:\Documents and Settings\****\Application Data\Anvsoft\Photo Slideshow Maker Platinum\template\premium\template\custom (**** is your administrator name). If you want to customize the flash template using flash program like Adobe Flash, you can download the source file of this customized flash template. 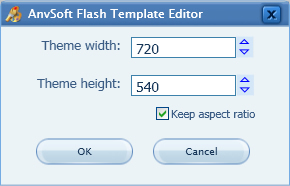 We have created a self-customized Premium flash template using the Template Editor. Watch it. And we provide downloadable .fla source file for you to customize a self-made flash template using flash items.